It may not have been the team's or even Bob Jungels' (Quick-Step) intention to solo to victory today. But when the opportunity presented itself, he had the legs and heart to make it happen. In the post race interview, Jungels said he was countering the attacks on the Cote de la Roche aux Faucons to put his teammate Julien Alaphilippe in a good position. 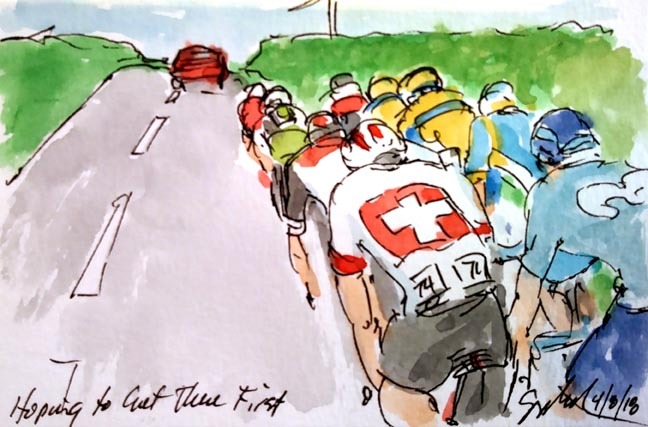 At the summit, the peloton just seemed to let the Luxembourg champion go. 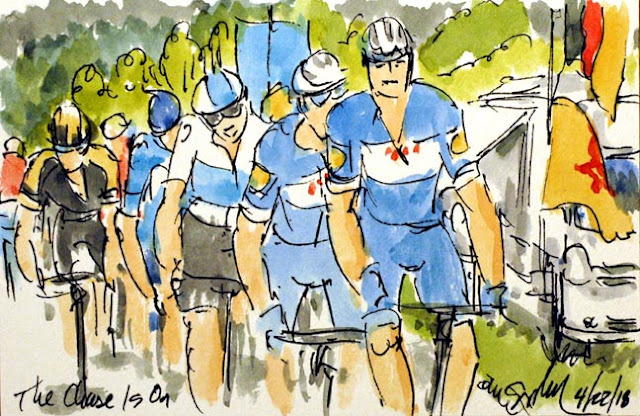 At that point, it fell to Alaphilippe to cover any counter attacks and to keep the peloton from chasing Jungels down. Quick-Step now has 27 wins this season, and are truly racing for each other, not just for themselves. With that attitude, they will continue to rack up victories all season long. Alaphilippe finished fourth on the day, with Michael Woods (EF Education First-Drapac) taking 2nd and Romain Bardet (Ag2r La Mondiale) claiming third on the day. Both coming in 37 seconds behind Jungels. Clearly this title is a play on the expression, "the luck of the Irish." 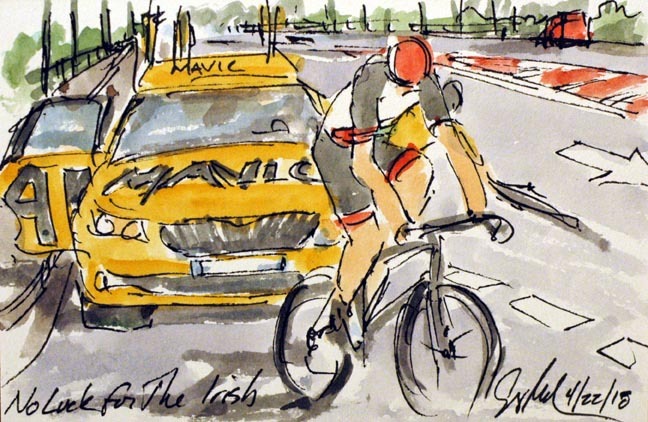 Dan Martin (UAE Team Emirates) - an Irish racer - had his team doing all of the chasing in hopes of a dramatic finish on the day. On the final climb he kept attacking to bridge across to the lone escapee, only to be pulled back by the rest of the select group. To add insult to that injury, he had a poorly timed flat front tire that required help from the Mavic neutral service vehicle. While the mechanic was quite fast, with just eight kilometers left, it was clear to Martin, that it wasn't going to be his day again. At one point during the wheel change, you could see him pound his helmet in frustration (not at the mechanic) knowing that his team's hard work would come to naught. With the final member of the early break caught, it was time for the attacks to come from the peloton. The Cote de la Roche aux Faucons provided the perfect launch pad. First to attack was Philippe Gilbert (Quick-Step) who was countered by Sergio Henao (Sky). Quick-Step has been able to use its strength in numbers to great affect this season, so it was that Bob Jungels (Quick-Step) that was able to counter the counter attack by Henao. Striving to hold onto the Luxembourg Champion's wheel was one of two Canadians in the race, Michael Woods (EF Education First-Drapac). With just twenty kilometers left to race, it was the time to try a split the peloton apart, and that is exactly what was taking place on the penultimate climb of the day. Liege Bastogne Liege: Damn, They're Here! I am sure that in his heart of hearts Jerome Baugnies (Wanty Groupe-Gobert) didn't honestly believe he would hold off the entire peloton. However, I am sure he was disappointed to see the Bahrain-Merida led peloton catch him at the bottom of the Cote de la Roche aux Faucons. 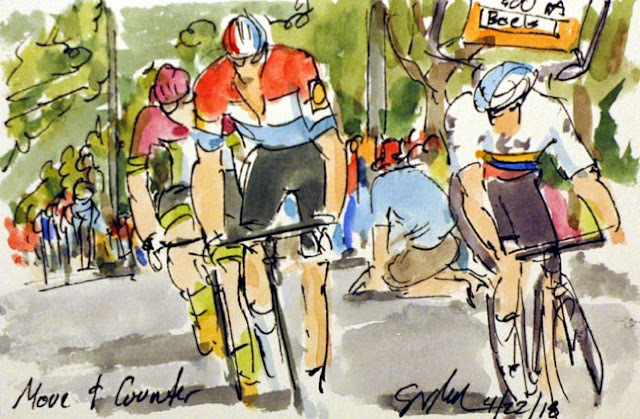 I am assuming that Vincenzo Nibali (Bahrain-Merida) put his team on the front in hopes of launching an attack on the fast approaching climb. Pulling back the last man of the break away was just an added advantage. The next member of the early break to try and escape was Jerome Baugnies (Wanty Groupe-Gobert). 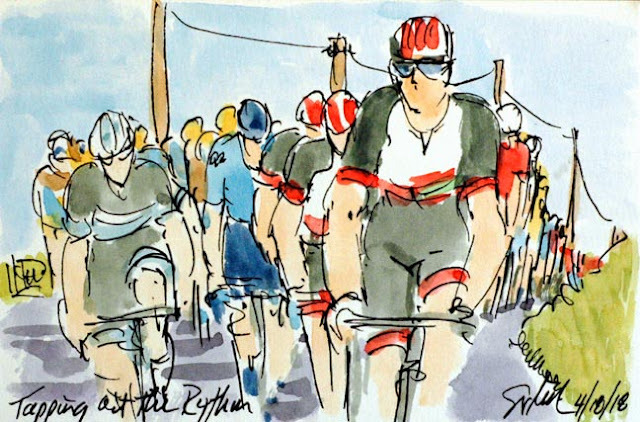 He was able to build a minute on the peloton and roughly a half minute on his erstwhile companions. With 33 kilometers (and two catagorized climbs to go) it was unlikely that his move would succeed, but it was still a valiant effort just the same. At least he got his team's sponsors names some air time and that is certainly of value. Some riders will refer to these efforts as a "TV Break Away" with the sole purpose of advertizing their sponsors, in this case I feel like Baugnies was genuine in his hopes to steal the show. 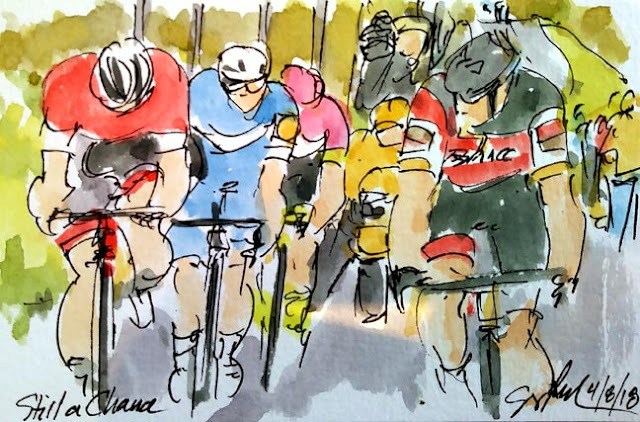 With just 37 kilometers left to race, it was time for the peloton to use the Cote de la Redoute to start the chase in earnest. 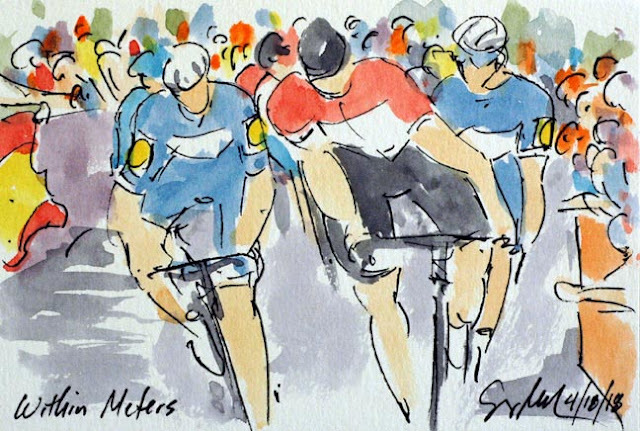 Enric Mas and Julian Alaphilippe (Quick-Step) hit the front and drove the pace in hopes of shedding some of their rivals. Tucked on to Alaphilippe's wheel was the strong man for Team Sky, Geraint Thomas. Thomas was marked in turned by Jose Rojas (Movistar) and so it went on down the long line of competitors, teammates and domestiques. Fans will line the route of every race, many flying flags of teams, countries on regions from their camp sites and campers along the sides of every climb. Cycling is about the only sport were fans can get close to their heros and not have to buy a ticket for the honor. Casper Pedersen's (Aqua Blue Sport) attack served only to split up the nine man break away. First, it left him to tired to stay with the chasers once they got back onto the Dane's wheel. And second, the chase left a few off the back to be swept up by the peloton in just a few minutes time. Those left on the front of the race included Pedersen's teammate, Mark Christian, along with Loic Vliegen (BMC), Jerome Baugnies (Wanty Groupe-Gobert), Paul Ourselin (Direct Energie) and Anthony Perez (Cofidis). 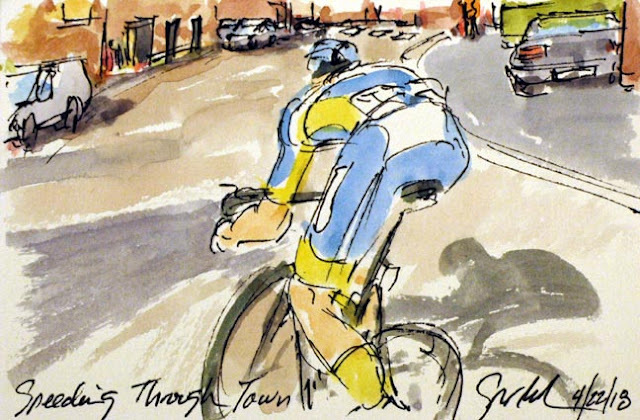 Perez road in the early break on Wednesday in La Fleche Wallone, only to find himself trying again today. Nothing ventured, nothing gained. Unlike multi-day stage races, there is now King of the Mountains jersey to be won in a single day race like Liege Bastogne Liege. However, there is prize money for being the first to crest each of the eleven catagorized climbs that make up this "Old Lady" of cycling. Jumping away from his eight break away companions was Casper Pedersen (Aqua Blue Sport). 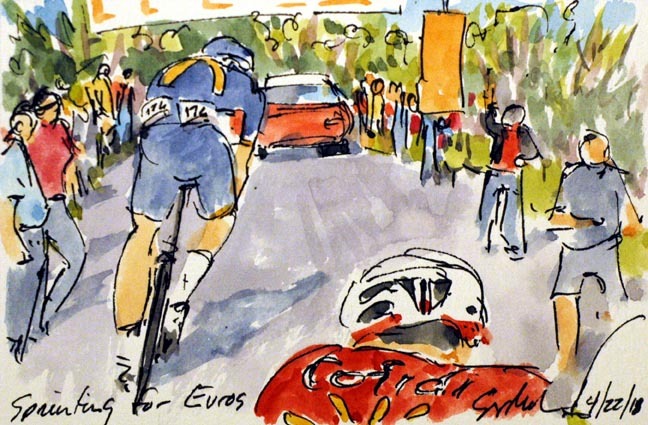 Anthony Perez (Cofidis) just watched him ride away perhaps in disbelief of the effort the Dane was putting in. Pedersen went on with his attack on the descent gaining about a half a minute on the rest of the break. With the Cote de Bellevaux lying so far from the finish of the day, it seemed a tall order to hold of a peloton that was already beginning to reel the break back in. Perhaps it was a little bit of foreshadowing, but it was Anna Van Der Breggen (Boels Dolman) who came to the finish alone. She had time to savor her victory (and zip up her jersey) before saluting the crowd. 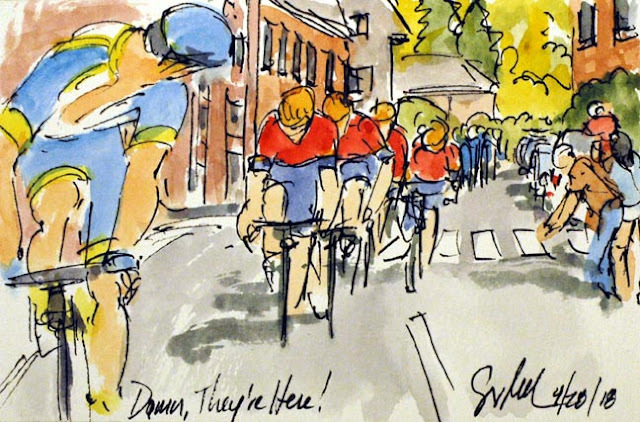 It is disappointing that all we could see of the second Women's Liege Bastogne Liege was the final kilometer. And even that little bit was sandwiched inbetween some duller moments of the early kilometers of the men's race. There has been some movement towards parody in prize money for men and women, now we need to get some parody in base salaries and TV/Web broadcast coverage. It was foreshadowing of how the men's race would be decided in about another three hours. 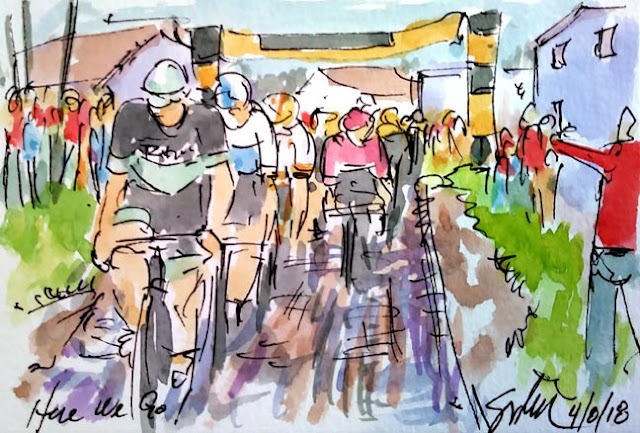 Fleche Wallonne: Leaving Them All! With his final kick, Julian Alaphilippe (Quickstep) was able to leave everyone behind. He didn't have time to offer a victory salute as he crossed the line, but I am sure the win was far more important than the celebration for the camera. Alejandro Valverde (Movistar) just didn't have the legs to close the gap to the Frenchman, but he did claimed the second step of the podium. Thus he traded places with Alaphilippe from 2017. Rounding out the podium was the Jelle Vanendert (Lotto Soudal) who had been the first to start the sprint (if you can call it that on the Mur de Huy) to the line. 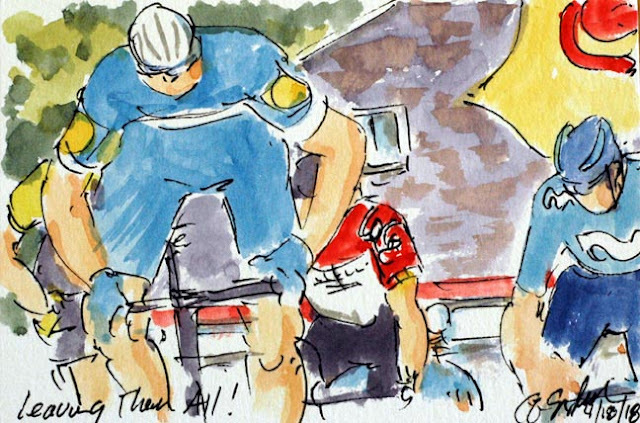 Poor Maximilian Schachmann (Quickstep) was caught within meters of the summit of the Mur de Huy. He could take some comfort in the fact that one of those he could see passing him was his teammate, Julian Alaphilippe. Leading the charge was Jelle Vanendert (Lotto Soudal). Surprisingly, there is no sign of the defending champion Alejandro Valverde (Movistar). 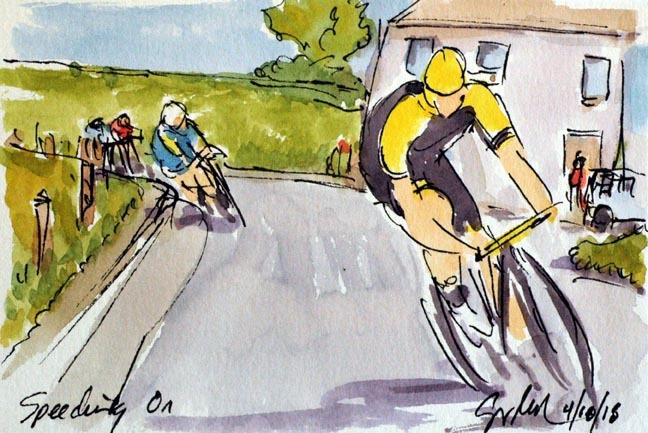 Could this be the year that he looses his steel grip on the race and this fabled climb? After the final climb of the Cote De Cherave, it was Jack Haig (Mitchelton-Scott) that drove the pace back down the other side of the climb. Surprisingly he and Maximilian Schachmann (Quickstep) were opening up a gap on Vincenzo Nibali (Bahrain-Merida) and Tanel Kangert (Astana). With just five kilometers left to race, Haig and Schachmann were able to hold off the peloton to the base of the final ascent of the Mur de Huy. 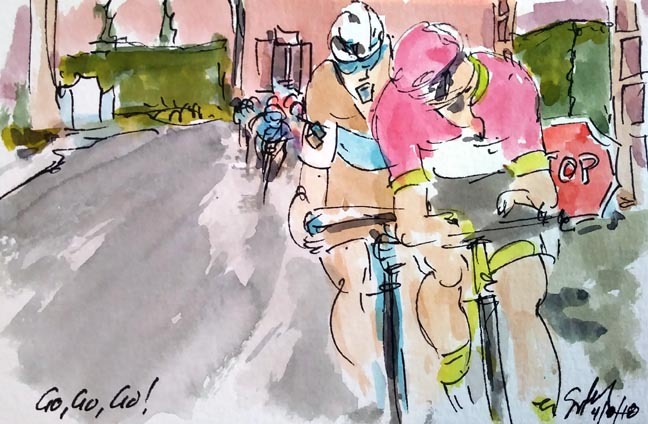 With teammates in the group up the road, both Michal Kwiatkowski (Sky) and Jakob Fuglsang (Astana) were annoyed with the TV moto being too close. While we enjoy getting nice images of the front of the peloton, their concern was that Mikel Landa (Movistar) was enjoying to much of a draft off of the moto. 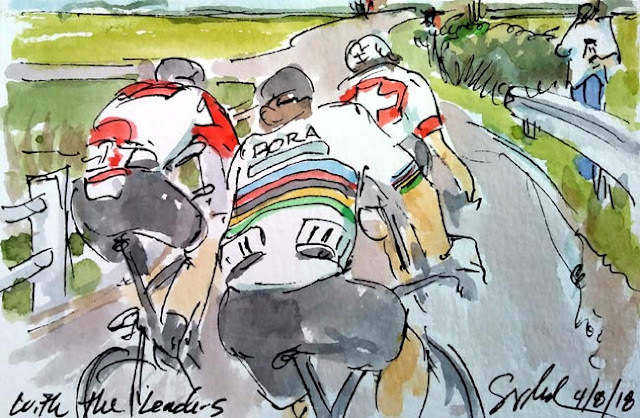 Landa was trying to pull back the escapees in order to set up his team leader (and winner of the last four Fleche Wallonnes) Alejandro Valverde. I enjoy have a little fun with titling my paintings. This one is a bit of a play on words. How many times have you told some one, "Just a minute."? Of course, the riders in the break were being told by the slateboard that the peloton was only one minute behind. 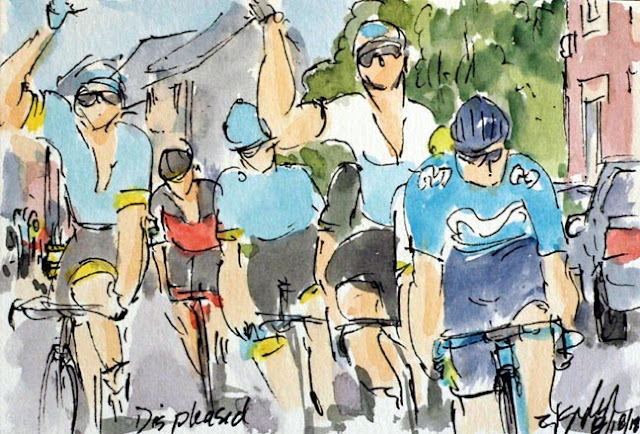 Patrick Muller (Vital Concept), Cesare Benedetti (Bora Hansgrohe), Anthony Roux (Groupama-FDJ), Anthony Perez (Cofidis) and Romain Combaud (Delko Marseille Provence) had built up a lead of almost three minutes, but could never really break free of the grasp of the peloton. 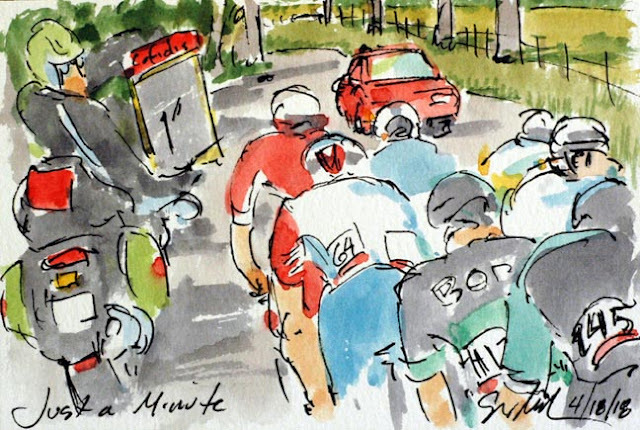 The course of Fleche Wallonne has the peloton climbing the fabled Mur de Huy three times. On the first trip up the climb, it was Rob Power (Mitchelton-Scott) launched a bit of an attack. His move was covered by former World Champion, Michal Kwiatkowski (Sky) and Bauke Mollema (Trek-Segafredo). There was still a group of eight guys further up the road, but they were less then two minutes ahead now. The crowds on the climb had already been able to watch the women's pro peloton climb this hill twice, now it was the turn of the men's teams. Some day I will figure out how to spell 'rhythm.' It is a shame there isn't spell check for my pen. UAE Team Emirates started the day taking on the responsiblity of keeping the early breakaway in check. Their Aussie rider, Rory Sutherland, got on the front of the peloton, with his teammates on his wheel, and tapped out a pace that kept the gap at a managable distance. He seemed not to change his cadence as he went up and over the Cote d'Amay for the first of three ascents. With the chasers unable to close the space between themselves and this duo of Peter Sagan (Bora-Hansgrohe) and Silvan Dillier (Ag2r La Mondiale), it was not a surprise to see Sagan out sprint the last member of the days early break. Immediately after this victory salure, Sagan reached out to congratulate Dillier and to thank him. 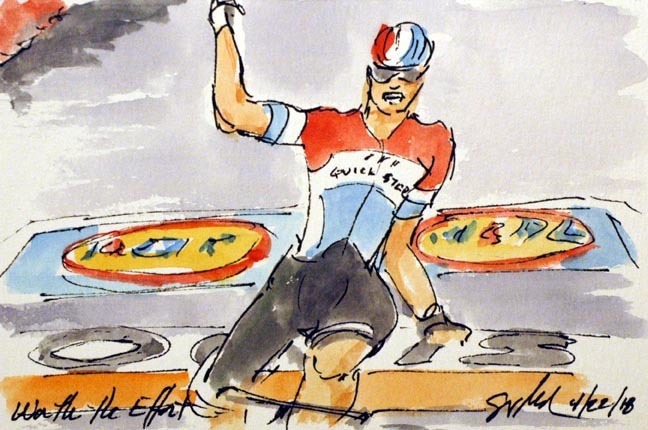 Had it not been for Dillier's efforts, it is certain that Sagan would have been caught. 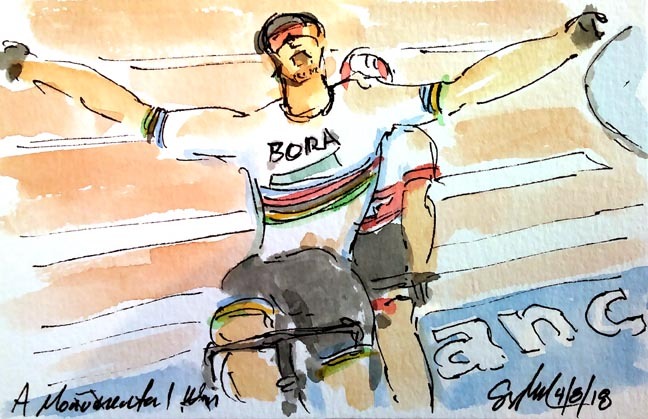 This is the first time the wearer of the Rainbow Jersey has won Paris Roubaix since Miguel Indurain did it in 1981. Let's hope that Sagan will continue to build on Indurain's achievements. Chapeau! Down to just two riders, it was the more experienced Peter Sagan (Bora-Hansgrohe) that got to the back as Silvan Dillier (Ag2r La Mondiale) let them onto the Velodrome. With less than a kilometer to go Dillier has now been off the front of the peloton for over 200 kilometers. Regardless of the finale, it would be a long shot if he were to out sprint Sagan, he has ridden a brilliant Paris Roubaix. 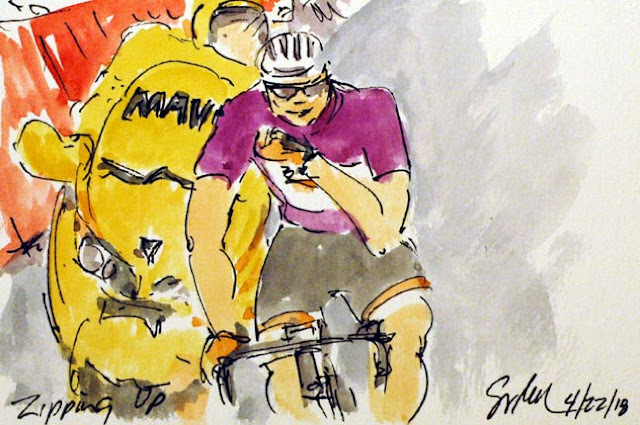 The roar of the crowd as one of cycling's favorites road into the arena was near deafening. It is now clear that the chasers just didn't have the legs to bring back the World Champion. 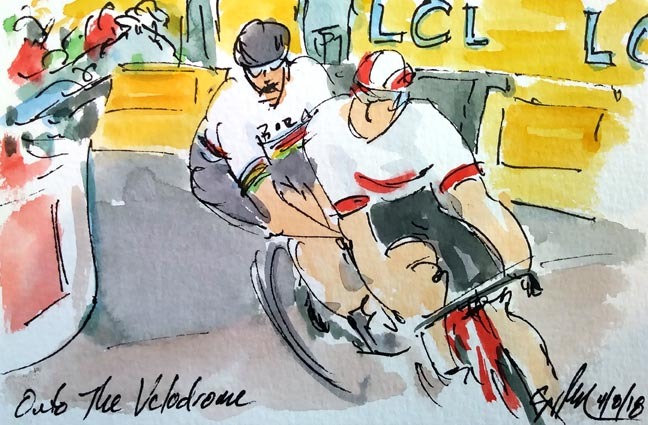 Using the normal formula that helps determine if the break will be caught, defending Paris Roubaix champion Greg Van Avermaet (BMC) should still be able to catch the leadering duo of Peter Sagan and Silvan Dillier. Greg Van Avermaet is trying to encourage his fellow chasers, Jasper Stuyven (Trek-Segafredo), Niki Terpstra (Quickstep) - he, too, has won in Roubaix before - and Sep Vanmarcke (EF Education First-Drapac) to work together. At this point there are 11 kilometers left before the showers, and the leaders have only a 52 second advantage. Close, but doable. Their efforts are being closely watched by the TV moto riding behind. Obviously, we are seeing this image by the leading TV Moto. Now with just 36 kilometers left to race, the early break away had dropped to just two riders, Jelle Wallays (Lotto Soudal) and Silvan Dillier (Ag2r La Mondiale). However, they have now been joined by the Rainbow Jersey of Peter Sagan (Bora-Hansgrohe). This trio was now adding to its advantage over the chasing peloton. With only a minute's advantage, it seems likely that they won't be arriving on the velodrome without the others, but this is Paris Roubaix, and there are still some very rough sections of pave to traverse. Paris Roubaix: Go, Go, Go! Only one cyclist from the United States took to the start in Compiegne. Taylor Phinney in his new colors of EF Education First-Drapac decided to be sure we all knew he was there. After Gilbert and Teunissen had been pulled back, it was Phinney to go on the offensive. He was joined by a rider from Ag2r La Mondiale (sorry I wasn't able to get his name) who seemed to be yelling for Phinney to go hard. I guess it should be, "Allez, allez, allez!" instead. 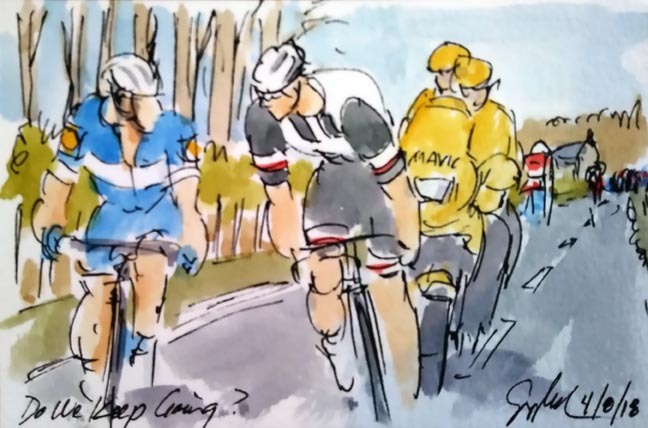 Paris Roubaix: Do We Keep Going? First it was Mike Teunissen (Sunweb) who launched a counter attack to catch the ever dwindling break away up the road. His move was quickly covered by Philippe Gilbert (Quickstep). Quickstep was playing a numbers game covering all of the moves and boasting two former winners of Paris Roubaix at the start of the day. The famed Tom Boonen, who has won this race four times, is a former member of the team as well. They know how to get this done. One snag with today, however, they have let Peter Sagan (Bora-Hansgrohe) slip up the road to join the remanents of the early break. Both Peter Sagan (Bora-Hansgrohe) and his teammate, Marcus Burghardt, led the peloton on to the most famous, and difficult section of pave through the forest of Arenberg. Riding tight on the wheel of the German National Champion are riders from Trek-Segafredo, EF Education First and Bahrain-Merida. 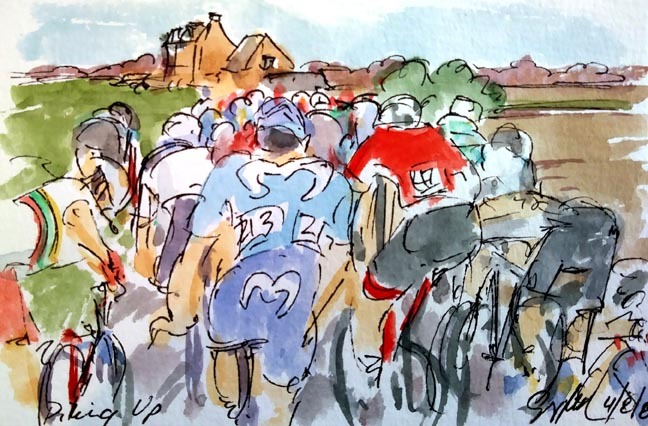 The entire course is now line with thousand of screaming fans of cycling and of the hell that is Paris-Roubaix. For the hearty, they have already seen a junior's version and the professional women's peloton ahead of the main event. With still another 93 kilometers to race, about 25 kilometers of pave, it is still most anyone's race. I must say though, that Bora-Hansgrohe seems to be setting it up for the World Champion, Peter Sagan. Unfortunately, a big part of Paris Roubaix is the crashes. Today seem to have a large share even before the riders hit the pave. Here the crash happened near the front of the peloton, leaving riders plowing into those already on the ground or riding out into the grass (and the spectators) in hopes of staying in contact with the front end of the peloton. Ignatas Knonvalovas (Groupama-FDJ), the Champion of Lithuania was one of those who went off of the bike, but other than his bike needing a little attention he was good to go. Both Hector Carretero (Movistar) and Boy Von Poppel (Trek-Segafredo) were able to get stopped, but others riding for both Mitchelton-Scott and Bahrain-Merida, weren't so fortunate. I don't make it a point to focus on the crashes, I would rather celebrate the athletism and grit of the race. It may be that I have raced and I know just how much it hurts to bounce off of the pavement. Fortunately for me, I have never crashed on a rough section of pave! "Here we go!" 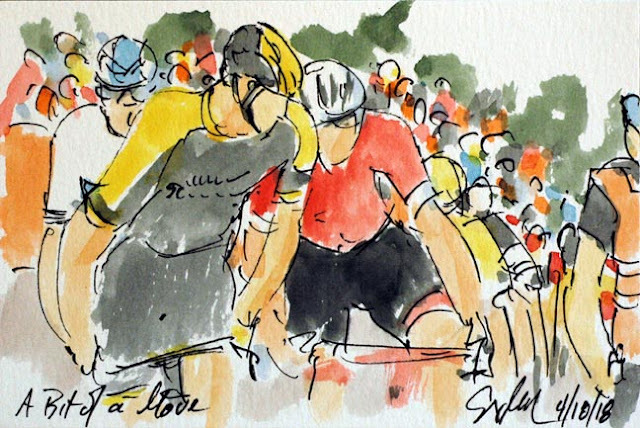 cried Paul Sherwen as the peloton hit Pave Section #29. The sections of rough cobble stones are numbered in reverse order, counting it down for the riders as they near the velodrome in Roubaix. With the peloton reaching this section in Troisvilles about six minutes behind the break, it was time for the serious racing to get underway. 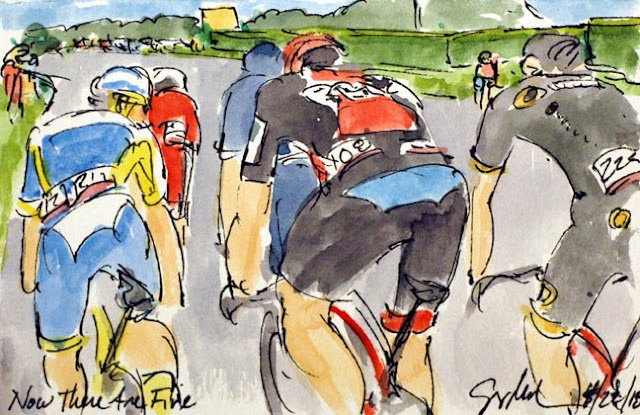 Three teams were vying for control of the peloton (and the best sight lines across the pave) including Bora-Hangrohe, Team Sky, and EF Education First - Drapac p/b Cannondale (that is the last time I will be using their full name). If it is racing, it is an early break away. 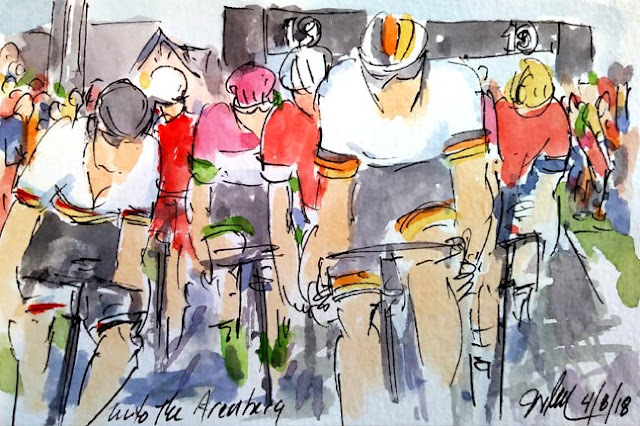 Today it was a group that swelled to nine riders that build up an eight and a half minute lead on the rather relaxed peloton. That would all change as soon as the first of the 29 sections of pave were reached in Troisvilles just another nine kilometers up the road. A couple of those at the back of the group included the Swiss National Champion, Silvan Dillier (Ag2r La Mondiale), Marc Soler (Movistar), Jay Thomson (Dimension Data) and Ludovic Robeet along with his teammate JImmy Duquenny (WB Aqua Protect). With a single day race, the rules of thumb go out the window when it comes to a break's success or eventual failure.